Want Everyone To See Your Credit Card Transactions? Of Course You Do. Meet Blippy. As the Internet matures, slowly but surely everything we do in the real world is going social. But there’s a limit to how much information we can explicitly share on all the various services. A new service, Blippy, launching today in private beta, has an interesting way to take something you do everyday, buy things with your credit card, and automatically push those transactions online for others to see and interact with. Yes, I know this is a controversial idea — that’s part of what makes it potentially a great one. 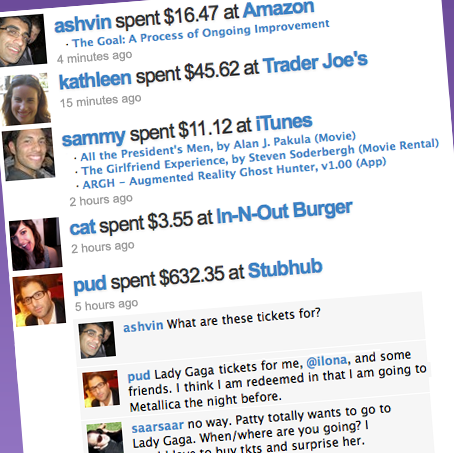 Imagine being able to see everything your friends buy with a credit card as they do it. This not only tells you what kind of things they’re actually into (rather than someone just saying they like something), but also other information like how cheap they are, as well as where they actually are at a given time. There is actually a lot of data tied into the transactions we make, and Blippy takes that and makes it social. Obviously, there will be some transactions you don’t want published for all to see on the Internet. That’s why one of the core ideas behind the service is that you’d only have one credit card (most people have many these days) that is your “Blippy card.” That is to say, you’d have one card that you know all the transactions you do on it get published. That itself creates some interesting social dynamics, as maybe you’ll start manipulating your spending habits on your cards to show just a certain side of yourself. And just imagine the fun everyone will have if you accidentally make an embarrassing purchase on this Blippy card. The service hopes to alleviate that fear by doing something like giving users a sticker to put on the card that’s their Blippy card, so they remember the transaction they’re about to make will be broadcast. That’s also an interesting way to spread the service naturally, when others see that sticker on your card and look into it. “The big question that Blippy answers is ‘What are your friends buying?‘,” co-founder Philip Kaplan (also known in the tech circle as “Pud”) explains. That is of course a take off of Twitter’s question “What are you doing?” — which was recently replaced by “What’s happening?” The key to all of those questions is simplicity. And despite being a concept that you have to think about the ramifications of, Blippy is perhaps even more simple because it employs what Kaplan dubs “passive sharing.” Again, you aren’t explicitly sharing anything via something like a message, your actions (buying things with your credit card) are being automatically pushed to the web. “Blippy provides transparency into normal everyday things,” Kaplan continues. This actually fits in perfectly with something Twitter CEO Evan Williams recently tweeted: “Many of the great businesses of the next decade will be about making information about our behaviors more visible.” That is exactly what Blippy is doing. Interestingly, Blippy also seems like a perfect compliment to Square, the new project by yet another Twitter co-founder, Jack Dorsey. Square creates the potential for anyone to be able to take credit card transactions with their mobile device. Imagine paying for something from a local street merchant, and it immediately showing up in your Blippy stream. But for now, the service is focusing on some of the bigger transactions you make. For example, when you buy something on iTunes, you can not only see how much the purchase cost, but also a detailed list of what was bought. The people that follow your Blippy stream can then comment on and “like” these transactions. This type of deep integration is only available for a few services right now, like iTunes, Amazon, and Zappos (other transactions, you can only see the place and the price, not the actual item), but you can see that eventually this is where they’d probably like to go. Just imagine the potential affiliate fees alone! And because the actual purchase prices are made visible, there are other interesting dynamics. For example, imagine being able to tell if you’re getting ripped off with what you’re paying for a gym membership or on your Comcast bill when compared to what your friends are spending on the same things. There’s also the potential to have private accounts that maybe a businessman would only share with his assistant to let them know what’s being purchased and explain things a bit better in the comments. Again, yes the idea is controversial, but there are a lot of interesting things that could come of it, if people are willing to be this transparent. The idea was so compelling to Kaplan that he actually left his role as an Entreprenuer In Residence at Charles River Ventures to join fellow co-founders Ashvin Kumar and Chris Estreich in the venture. Kaplan is best known as the guy who started FuckedCompany at the end of the first Internet bubble, and went on to start AdBrite. I had a chance to meet with Kaplan to talk about the service and shot the video below of him explaining the core concept of Blippy. Again, Blippy is launching as an invite-only private beta today. Visit their homepage for a way to sign up to be notified when they start letting other people in.